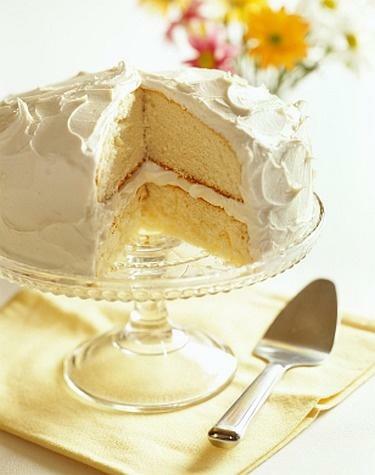 I have more than the best homemade French vanilla cake recipe, check out more dessert recipes at the end of the page. Here's a tip for this cake recipe: If the butter is not completely soft, you will have to beat it for several minutes to get the light and fluffy texture. PREHEAT oven to 350 degrees. Butter two 9 inch cake pans and dust the inside with flour and tap out excess. Line the bottom of the pans with wax or parchment paper. Put the cake pans on a baking sheet lined with parchment paper or a silicone mat for easy clean up. Place the softened butter in a mixing bowl and beat with the high ratio vegetable shortening for 3 minutes. Scrape down the sides and add the salt and mix. Add the powdered sugar and start out on low until combined. Beat on high for 3 minutes. Add the butter and vanilla extract and beat until light and fluffy; another 5 minutes. tastes just like a wedding cake! 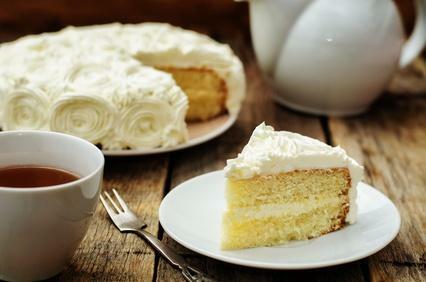 The French vanilla cake recipe (with almond flavoring) below is worth it's weight in gold and tastes just like a wedding cake. You can now make it at home and save money. It starts out with a basic vanilla cake mix and we "doctor it up" to taste amazing. Enjoy. PREHEAT oven to 325 degrees, and grease/butter either two 8" or 9" cake pans - or even a 9x13 pan. In a large mixing bowl, add first four ingredients in this recipe and make a well in the middle. In a small bowl, mix the egg whites with the water and vegetable oil and add to the bowl. Mix for a few seconds and add the remaining ingredients. Beat for 2 minutes (time it) and pour into the prepared pan(s) a little more than half full. Then drop the pans on the counter to bring the air bubbles to the top of the cake and pop most of the air bubbles in the batter. Bake for approximately 36-40 minutes in a 9x13 pan. If you are using cake pans, check after 25 minutes or so, a jelly roll pan is approximately 22-24 minutes and cupcakes are 16-19 minutes. Folks, these are estimates only because every oven is different so keep an eye on them and use a toothpick to check for doneness. It really tastes like it's a cake made from scratch, doesn't it? You may use your own recipe for this cake, but mine is awesome - try it. Makes 3 cups. The filling and roses were made using my Vanilla Whipped Cream Frosting. Use a chocolate mix and substitute 3 WHOLE eggs instead of the egg whites. Use frozen berries. Thaw and reserve the yummy juice and use this juice for part of the water in the recipe. Use 1 cup fresh lemon juice and 1/3 cup of water. Use 3 whole eggs instead of the egg whites. Use 1 TBS of fresh lemon zest and 1 tsp pure lemon extract instead of the almond extract.